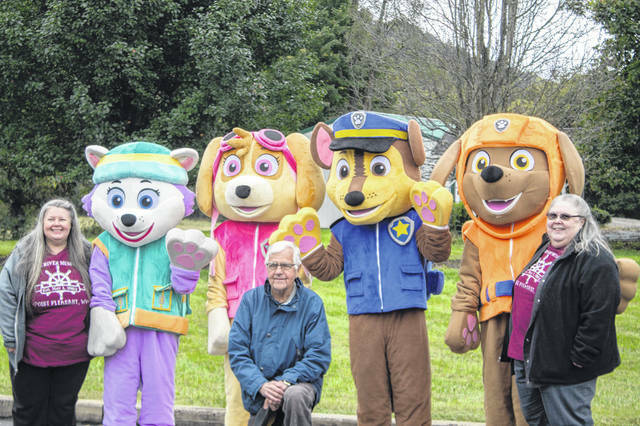 Representatives from the Point Pleasant River Museum and Learning Center are pictured with the Paw Patrol characters during the recent event at Farmers Bank in Point Pleasant. 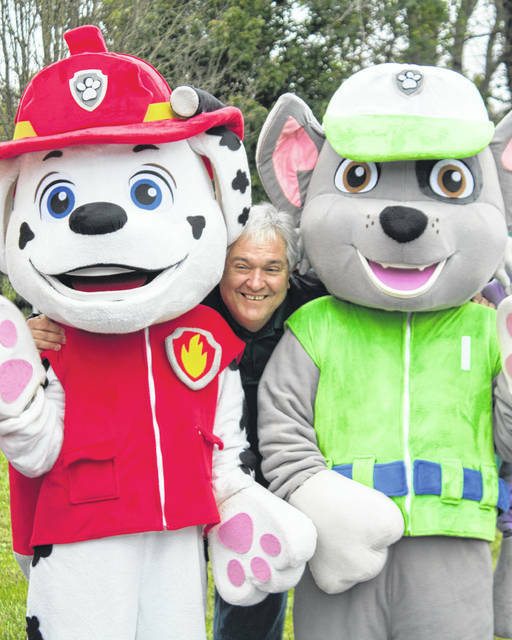 Farmers Bank President Paul Reed is pictured with the Paw Patrol characters. POINT PLEASANT — More than 650 people attended the recent Paw Patrol event and open house at the Point Pleasant branch of Farmers Bank. “It was a great morning,” said Marketing Manager Dru Reed of the event, which brought people from north of Lancaster and south of Putnam County in West Virginia. While the event was free, donations collected will be going to the Point Pleasant River Museum and Learning Center as they work to rebuild from a fire earlier this summer. Over $500 was raised during the open house, with a special promotion running through November in order to raise more money for the organizations. Farmers Bank will be making a $50 donation to the River Museum for every new account opened with Farmers Bank in October and November. Donations will be matched up to $2,000 by the bank. Reed noted that the event would not have been a success without the assistance of local police officers, neighbors, community members and French City Daycare, where the bank obtained the costumes. https://www.mydailysentinel.com/wp-content/uploads/sites/14/2018/10/web1_10.25-FB-1_ne2018102416940859.jpgRepresentatives from the Point Pleasant River Museum and Learning Center are pictured with the Paw Patrol characters during the recent event at Farmers Bank in Point Pleasant. https://www.mydailysentinel.com/wp-content/uploads/sites/14/2018/10/web1_10.25-FB-2_ne2018102416948120.jpgFarmers Bank President Paul Reed is pictured with the Paw Patrol characters.